Read testimonials directly from our satisfied customers and friends and find out if our puppies are what you are looking for. If you have purchased one of our puppies we would love to hear from you. I enjoy seeing your “pup-dates” on Facebook and really enjoy seeing all of Lily’s siblings growing. Our Lily is growing so fast! She’s such a funny girl. She’s definitely a water dog. She’s spoiled and has her own swimming pool. She’s even learned to jump from the dock at the lake. We’ve gone on our first family camping trip and she LOVED it!! We love her so much and she’s a wonderful addition to our family. Keep those ” pup-dates” coming and good luck with your upcoming litter. My family is extremely happy with Tiltonhaus and our puppy Laci. She is our first German Shepherd (GSD) and is everything that we hoped for (i.e., intelligent, social, energetic and a great companion to our 6 year-old Rhodesian Ridgeback). After an extensive search, we selected Tiltonhaus because it was evident that Tammy pours her heart and soul into breeding high quality GSDs. 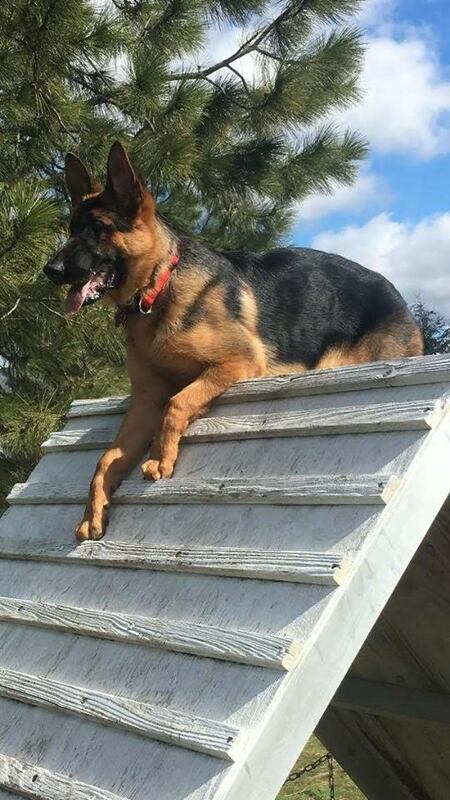 More importantly, she is very responsive and has gone above and beyond with additional advice on how to train and maintain a happy and healthy GSD. You will not be forgotten or ignored after bringing your new puppy home. Tammy is a caring individual that spreads joy into the world, one puppy at a time. Just wanted to send an update on Memphis…as you can see he’s doing great! Finally lost that massive winter coat he had this year, and he’s keeping his weight at about 90 lbs. In the pictures you can see he loves that old soccer ball, always sleeps half on – half off his bed, and that is the pose he does when he wants his belly scratched, lol. He is such a loving dog, and is always looking out for us. He even feels the need to protect our other dog from potentially dangerous things, like standing between him and the vet, it’s so funny!!. He LOVES the water! We keep a little kiddie pool on the deck for him, he likes to play in the sprinklers and loses his mind when we turn on the hose! He loves to swim anywhere we go that has water – definitely a water dog. Next pix will be water pix, promise 🙂 We love him and can’t thank you enough for bringing him into our lives. I’m always watching your puppies online, just adorable… And please give Ella a great big kiss for us! Here’s a picture of Pomai, she weighs 70 lbs now. She loves playing fetch and the flirt pole is her favorite toy. She is the “boss” of her brother. She follows me everywhere and has to know where everyone in the “pack” is at all times. She is a handful at times but we love our “blessings ” of a girl. She hasn’t had her first heat yet. I wanted to take a moment and send you a few pictures of Juno and tell you how wonderful she is. She is about 65 pounds, nearing 8 months old. She is unbelievably smart and loving. Today, we introduced her to her first outing in the snow and she absolutely loved it. Thank you so much for bringing her into our lives. She is truly a great companion and a valuable member of our family. Griffey was born on January 18th, 2015 (dark blue) and we took him home on March 6th. I wanted to reach out and let you know how grateful we are for Griffey. Griffey was the last pick of the litter, probably because at the time he had a tiny heart murmur and was very rambunctious running around the house. Since then the vet has cleared Griffey of any heart problems. Griffey has become the child in our family. He loves the dog park, he is extremely friendly with all people and loves playing with other dogs. He also loves to cuddle on the couch, and his favorite thing in the entire world is water – I had no idea we got a natural born swimmer! We constantly get compliments on how “beautiful” our dog is. Griffey now weighs 95 pounds! We are so grateful to have him in our lives and want to thank you for giving us the opportunity to add him as a member of our family. 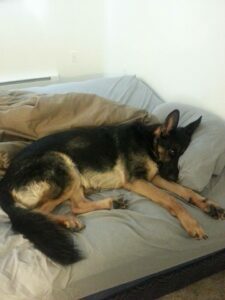 We are hoping to get him a brother or sister in the next year or so and would love another German Shepherd from you. Hope your family is doing well! My fur baby boy is 3 today!!! From 2 days old I have been in love with him, even when I wasn’t sure he would be ours but praying he would be, the moment he snuggled up into my sweatshirt when I was holding him at 2 days old I was a lost cause and I knew he had pick us more then we had picked him. He has been an ever present source of love and comfort for me through the last 3 years. If I’m ever having a bad day, one look at his derpy happy face, a giggle later and he has changed my mood. I could not ever imagine my life with out my Hunter! Thank you to(Tammey Tilton)Tiltonhaus German Shepherds for breeding such amazing pups! This pup is 3 years old today! Crazy how time flies! Thank you Tammey Tilton for breeding such awesome dogs. Hunter is everything we ever wanted and more. Hi, Amelia is doing awesome! We have been training her since we got her and is very smart. She is an alpha dog but we are alpha over her so we do not have any probables with her. She knows how to heal without a leash and stays to our side or behind us, she is crate trained, she waits, sits, stays, etc.. She does great in daycare. We get a lot of complements on her. People can not believe she does not need a lease at her age. 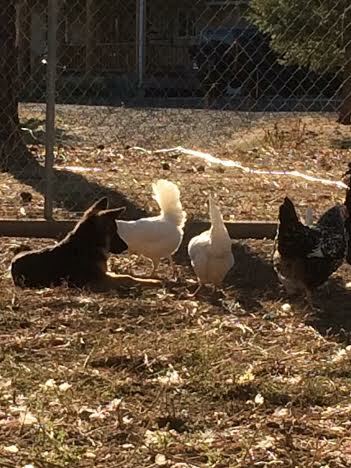 I am training her with the chickens also. This is the only pic I have of her on my phone as an older puppy. Thank you she is awesome!